Well…. even the lovely little people in our cardboard box doll’s house need to celebrate Christmas… so today we made some decorations for the doll’s house, that also double up as Christmas Tree ornaments… Perfect for little or big hands. 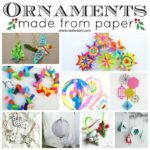 Make them yourself (and let them magically appear over night in the doll’s house or just decorate your tree) or with your children. 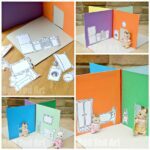 I know I haven’t published my doll’s house “how to” yet.. only a teaser photo. 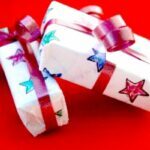 I *promise* it IS coming.. there have just been so many great Christmassy Guest Post to do first! 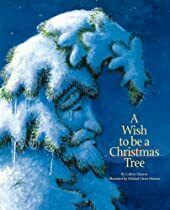 Aaaaaah an adorable book about a fir tree on a Christmas tree farm, that has grown too tall for anyone to want it (or be able to fit into their house). The tree knows this and is very very sad as each year the people come and choose the trees around him. The animals of the forrest see how upset the tree gets and decide that one night, when he is asleep they will ocme and surprise him. Decorating the tree in their own special way and showing him how much he is loved by all the animals and what he has done for them over the years. We love the prose and we ADORE the illustrations. Gorgeous for the advent season. Well… I always knew I wanted to make a Christmas tree with the children as one their advent calendar activities. And there are SO MANY fabulous ideas out there, I was a little stumped as to which to do.. in the end we kept it VERY simple and it was just perfect. Me and My Shadow made similar ones as table place markers.. ours will go in the house.. but you can also include a ribbon and hang them in your tree.. or decorate your mantle piece?! So make them, use them, have fun. 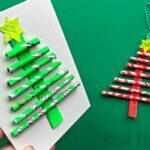 Materials: Card & green paint (or, ahem, green card), glue, things to stick on, scissors, ribbon for hanging if need be! 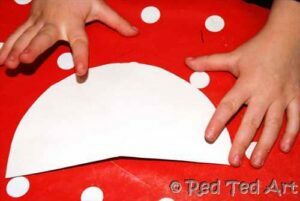 1) Cut a semi circle. I used a small plate as a template. 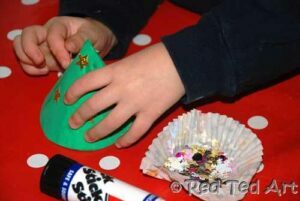 Later we made a bigger taller tree, for which we used a quarter of a circle using a dinner plate as a template. 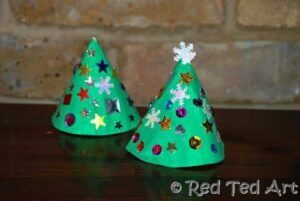 2) Glue into a cone and add your ribbon if you will use these as hanging ornaments. If necessary paint! 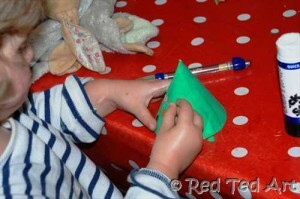 3) Once dry add your decorations. 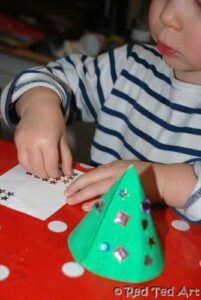 We had: lots of sequin-cy things, some left over gems and later I found some sticker stars (very popular). We stuck two snowflake sequins together to make a Christmas tree topper! 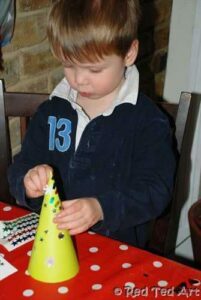 I was impressed with how well Pip Squeak was managing the sticking! She is only 2yrs! 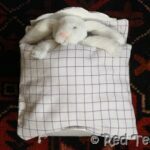 Red Ted is 3.75yrs. The kids ADORED it. And they loved putting the trees in the doll’s house! Lovely, no?!? The doll’s house is now fully accessories for Christmas… alternatively make paper chains and Christmas Tree ornaments for your own tree! 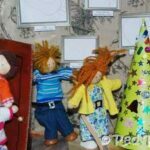 Such a fun idea to decorate the dolls house! Still haven\’t decorated our house but after reading this I may have to do the dolls house first. So cute. That is an adorable sounding book! 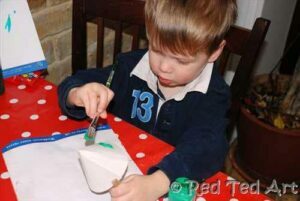 Working London Mummy – dolls\’ house coming next Friday. *Finally*. Wow, thanks for the mention. I LOVE your dolls house trees, what a great idea. Hehehe was never meant to tease you guys… have been *desperate* to post the house ever since Pip Squeak\’s birthday (well over a month ago).. but Christmas go \”in the way\”… 😉 Next Friday! Next Friday!! Blue Peter eat your heart out. 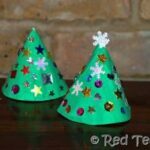 How fabulous to decorate the doll\’s house and make mini Christmas trees. Delightful. *beam* especially since I used to LOVE Blue Peter… ahh the memories! 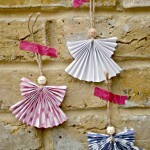 These are so cute, doing decorations in miniature for a dolls house is such a great idea. I used to love my dolls house when I was a kid and played with it for hours, can\’t wait to see your dolls house. No problem and have deleted one! What a cute idea to decorate the doll\’s house for Christmas! 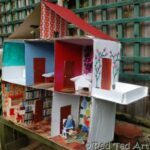 I\’m giving our girls my old (homemade) doll house for Christmas this year — this could be a great way to keep Princess Pea entertained during the holidays! 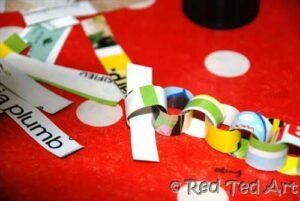 Loving the mini paper chains. Cute idea. Can\’t have the dolls missing out on a bit of Christmas cheer! 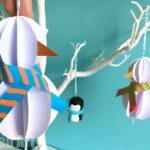 Thanks for the reminder about paper chains. I haven\’t made them for years and years. Wow, you were right – our Christmas trees are so similar. Identical twins and souls! 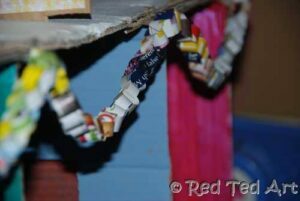 Love the idea of a paper chain to decorate the doll house! Rashmie – I know! 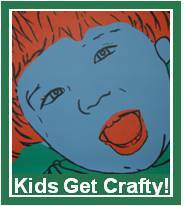 I saw yours and though \”oh-oh\” and then I thought… it doesn\’t matter… we are allowed to do similar crafts and we can\’t let our dolls miss out! Kindred spirits indeed! So fun! 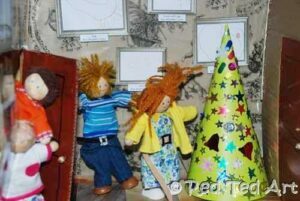 Love the tree craft and decorating the doll house.